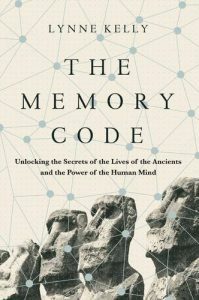 There have been lots of articles about The Memory Code. Lots of interviews and lots of talks. I was reflecting back on the past eighteen months as I head into the final stages of preparing the manuscript for the next book. There is one article which I keep returning to because it is from a magazine I hugely respect and a writer who got it so right, and wrote about it so well. Jim Rountree writes for Australia’s leading science magazine, Cosmos. Click on the images and you will get the full article. I have copied the start of the article below. It was originally published just over a year ago. It is a real buzz as an author to have someone understand your ideas so well. “Most of us know a place where sculpted rocks, majestic trees or perhaps the light give us a feeling the place is special. We sense something mysterious and wonderful – beyond the normality of everyday life. Now, imagine you are young and visiting such a place. It is in the land of your people, a clan of hunter-gatherers. Your parents tell you the story of the place. You can see the marks left as mythical ancestors fought and played, acting out momentous, tragic events. You will never forget this story, and you will never forget the place. They are locked together in your mind. But the story doesn’t stop there. The ancestors roamed clan territory, leaving traces at every point. It’s easy to remember their bizarre, dramatic acts, which become inseparable from the marks they left behind on the landscape. Story and land merge in a mental map that means you always know where you are and what lies in every direction. Now you are older and ready to be initiated. Back at the special place you learn there is more to the story. The ancestor turned into a millipede leaving those marks – one for each verse of a song you must now learn; many generations old, it holds vital information you can’t afford to get wrong. Time passes – you are an elder. You know a thousand songs, chants, stories and dances. They tell about the animals – their life cycles, how they feed and breed, how to hunt them and the rules for dividing the kill. You know which plants you can eat and how to prepare them. The songs tell you the clues, on land and in the night sky, of the passing seasons, so you know when to move as game becomes abundant or plants fruit. The songs tell you the laws of your people and the gods and spirits you must appease. They contain your people’s history and relations with neighbouring groups. As an elder you have authority, with others, to create new stories for events worthy of memory. With so much to remember you have songs to list and a ceremonial cycle mapped to each of the locations you visit, so you can be certain that every story is regularly rehearsed. Spread through your mind and the minds of others in your group is the total knowledge of your people. It is a repository of incredible detail, containing information of practical importance as well as the beliefs that define your understanding of the universe and your place within it. Without a written language, you must keep it ever alive and pass it on completely and accurately. So of course, you use the method by which it came to you, in interwoven branches of story and song that emanate from the landscape myths you learnt as a child. The whole of your country serves as a gigantic mnemonic device for this knowledge. The trick of using stories tied to features in a location as a memory aid is no secret. Modern speed-memory competitors use the technique, linking each card in a deck to locations within a familiar place pictured in the mind’s eye – a so-called memory palace, a mnemonic device first used in ancient Greece and Rome. Ethnologists have known for some time how preliterate societies told stories linked to their environments. We can see the method in oral cultures of Native Americans, Africans, Polynesians and Australian Aborigines. Once all peoples must have used systems of this kind. In the Western tradition, for example, the Iliad was recited from memory. 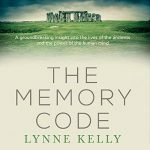 In her latest book, The Memory Code, Australian science writer and La Trobe University oral history researcher Lynne Kelly stresses the effectiveness of the method to accurately remember and transmit vast amounts of knowledge. 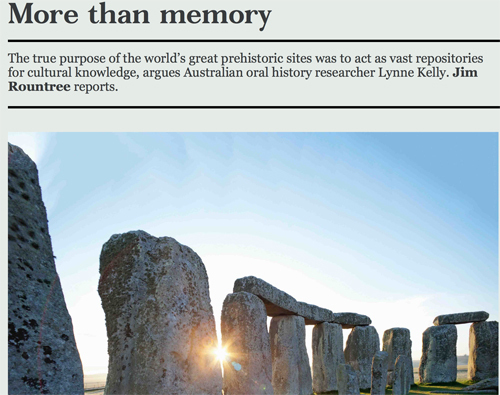 This sets the ground for her main thesis: that numerous prehistoric sites around the world had a primary function as memory aids, serving as knowledge centres for peoples transitioning from hunter-gatherer to settled agricultural lifestyles. Her list includes henges, cairns and standing stones in Western Europe, Göbekli Tepe in Turkey, Neolithic temple complexes in Malta, Pueblo “great houses” in the southwestern United States and the giant, geometric animals cut into the Nazca Plain in Peru. The basic idea is simple.” And the rest is on the Cosmos Website. Thank you Jim Rountree for taking the time to really understand what I am on about. And thank you Cosmos for being the great magazine that you are. 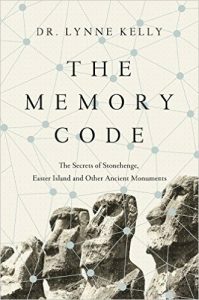 This entry was posted in archaeology, art of memory, memory, memory devices, memory palace, memory places, method of loci, mnemonic devices, songlines, Stonehenge, The Memory Code and tagged art of memory, Stonehenge, The Memory Code. Bookmark the permalink. That’s a great article. My one question would be re his quote “serving as knowledge centres for peoples transitioning from hunter-gatherer to settled agricultural lifestyles..” If I’ve understood correctly, these techniques were used for thousands of years before that transition occurred – in the case of the Australian aborigines for example. I guess he may just be referring to specific sites that arose during that transition period however. It’s potentially such a huge piece of the puzzle as to how we survived, thrived and “civilised” as a species. Looking forward to the next book Lynne! Thank you so much for your comment, Mike. It is greatly appreciated. The reference to the transition is for the monuments, not for the memory methods. Your 540,000 years looks promising, but I feel pretentious suggesting 60,000 years and only modern humans! It is a wonderful puzzle and one I will look at in the future. It’s not a question I am addressing in the next book which is specifically on the memory methods and applying them in contemporary life – adding in some medieval and Asian techniques. So much fun to be had! Maybe you would like to follow through the how-far-back puzzle? I’d love to hear any further thoughts.